Mike finishing a race, just as I hope to finish the Boston Marathon. 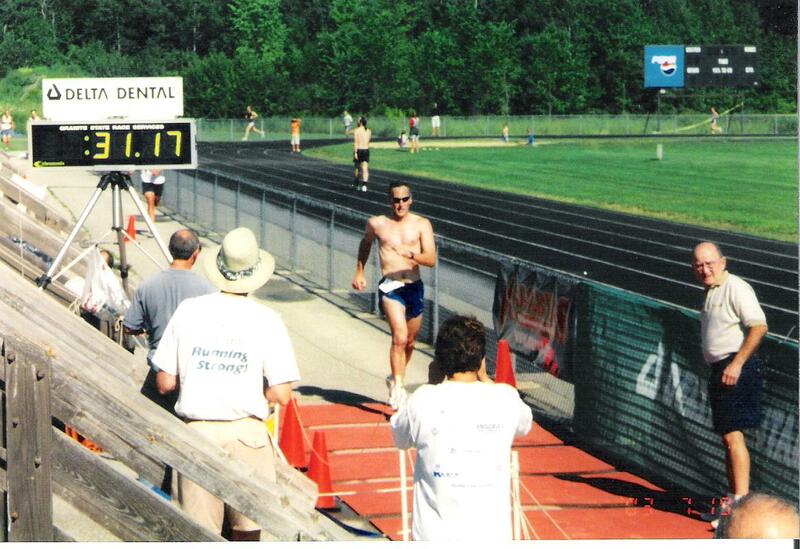 When I got the idea in my head to raise money to fight Ocular Melanoma by running the Boston Marathon on Team Eye and Ear, my motivation was to honor my late brother-in-law, Mike Kimball. Over the ensuing months, this project has evolved into something greater than that, and I have no doubt that Mike and his family would approve. Earlier this week Cheryl and I had the privilege of meeting Sandy and Tom, a mother and father of someone currently battling ocular melanoma. (Since the person afflicted has children of his own who may or may not understand the seriousness of their Dad’s situation, I’m leaving out the last names.) They live in a town near us and were surprised as we were to learn about another case of ocular melanoma so close to home (since it’s so rare.) They have been thorough and exhaustive in their research as they’ve advocated for their son, who was first diagnosed back in 2002. An eye operation back then seemed to have addressed the melanoma, but more recently it has been found elsewhere, and the battle is ongoing. The good news is that there have been developments in the last decade that provide considerable hope. Sandy and Tom’s son may be incredibly unlucky to have been afflicted so randomly by ocular melanoma, but he is fortunate to have such caring, determined parents who want not only a positive outcome for their son, but for anyone else who finds themselves similarly stricken. Thank you Sandy and Tom. Since I started this campaign I also learned about the McDonald family, who has a home right around the corner from our farm. George McDonald died of ocular melanoma just last May, and they are equally dedicated to honoring George’s memory by helping Eye and Ear researchers find ways to beat the disease. Thank you to them. So as I anticipate the actual running of the Boston Marathon on Monday, my quest has broadened. I will still run in honor of Mike Kimball, but I will also carry with me the caring memories the McDonald’s have of George as well as the hopes of Sandy and Tom for their son. Along the way others have encouraged me and donated in honor of their own friends and family who have faced cancer in some form. I am certain that they will all lift me along the 26.2-mile route. Congratulations on finishing the race Jack! You are an honorable man and your brother would be proud. Thank you very much for your efforts to raise money to fight ocular melanoma. It is amazing what someone can do when you are doing it for someone that you cared about very much. Thank you so much for everything you have and are doing for ocular melanoma. I was so pleased to follow you with the race at each point of the race and then to see that you actually finish the race which was your dream to do for your brother-in-law(with the worst weather conditions). It was an honor to meet both you and your wife.